You would have known the debates, legends and confusions surrounding the history of many casino games like poker, but when it come slot machines, mankind clearly knows how the history of slot machines evolved. The story began with Sittman and Pitt designed the first machine, which was the first of its kind, to be used as a model for the creation of many machines which followed. Here, what determined whether you had won or lost were the poker combinations, since this machine was based on the same game, and had five drums in total. The number of symbols was 50, and the player who was supposed to put in a nickel, would do one of these two things-spin the wheel or pull the lever down. According the symbols which were eventually displayed, the machine paid out. Hailed as the 'Father of Slot machines', one of the most indisputable and unquestionable title was given to Charles Fey for creating the first slot machine, as it is called today, in the 1880s. Fey's life wasn't free of troubles, rather he led a life full of hardships. After saving money so that he could move to the United States and settle there, in order to pursue his passion for machines, Fey was infected with TB, and the consensus of the doctors was that Fey had only a year of life left. However, Fey survived and lived on for many more years. The first machine called the Liberty Bell was Fey's biggest contribution to the gambling world, yet unparalleled in the history of gambling in terms of its impact and influence, as well it's instant flabbergasting popularity! Mills Novelty Company was one of the renowned reputed companies during the late 1800s and the 1900s, and Fey's collaboration with this company in 1907 was another landmark in the history: because the result was the Mills Liberty Bell, which was came with a case made of cast iron, with iron toes, which would be done way with later on. 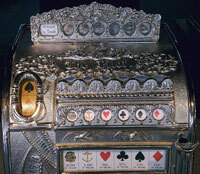 Many aspects were changed later; for instance the machine had a bell and if a player won, the bell would ring. This was also removed. 1910 and 1915 were two another landmark years. 1910 saw the emergence of the Operator Bell, which was another modified version of the Liberty Bell, light in weight with the introduction of reels that had fruit symbols on them. 1915, on the other hand, saw again the scrapping of the cast iron, which made the machines not only costly, but also heavy, and the beginning of the concept of wood cabinets for machines. Electromechanical Era: Soon, electro-mechanical swept over the world of slot machines, with modern day machines like Big Bertha and Super big bertha being launched. Bally Manufacturing was one of the pioneer firms which persisted in coming up with innovations like the Dollar Slot Machine.